Trees are a vital part of any landscape, whether a municipal park, apartment complex or your home’s front and back yard. 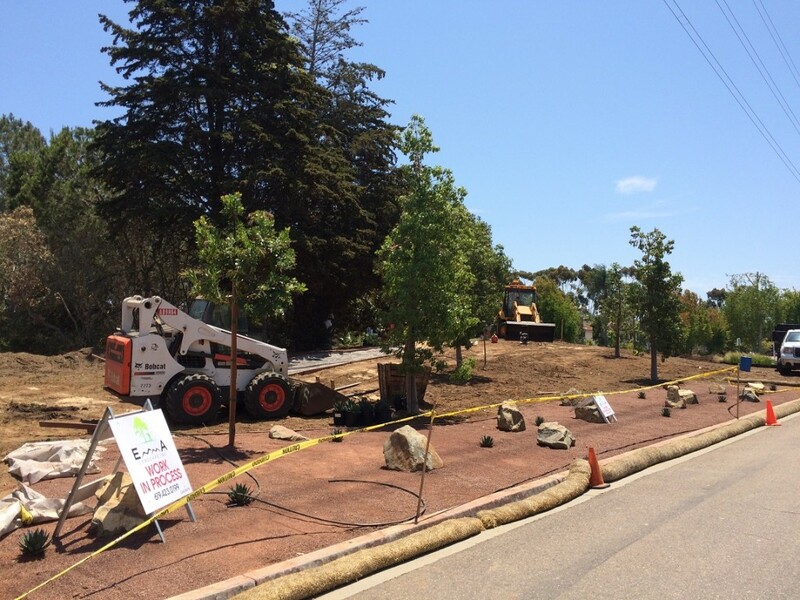 Unfortunately, many of the removal projects we perform are to remove otherwise healthy and beautiful trees which never should have been planted in their current location. A little research, planning and advice from the experts will help ensure your landscape includes trees that will grow well, remain healthy, provide shade, and add beauty and value to your home. Height: When full-grown, will the tree interfere with power lines, the eaves of your roof or other objects? Roots: Some tree species have roots which stay closer to the surface. These roots can pose a hazard and make it difficult to grow grass. Consider the distance from all structures, foundations and sidewalks, as tree roots can cause extensive and expensive damage. Canopy Spread: How wide will the canopy of the tree grow? Will the tree have adequate space to grow and spread without causing damage to structures? 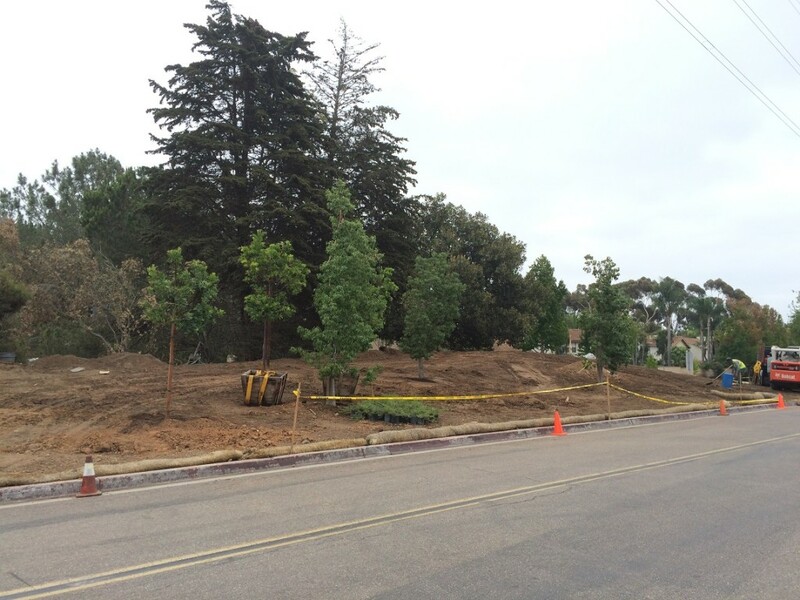 Will the new tree grow too close to existing trees? Shape: Round or V-Shaped tree species provide better shade, while columnar trees require less space. Coniferous or Deciduous: Will this tree lose its leaves as seasons change? Growth Rate: How long will it take for your tree to reach its’ full height? Maintenance Costs: How often will the tree need to be trimmed? Some species, including many palms, will require tree trimming every 1-2 years. Fruit: Aside from edible fruit trees, many trees grow fruit which can drop and make a mess of sidewalks and roofs. Do you want that mess? 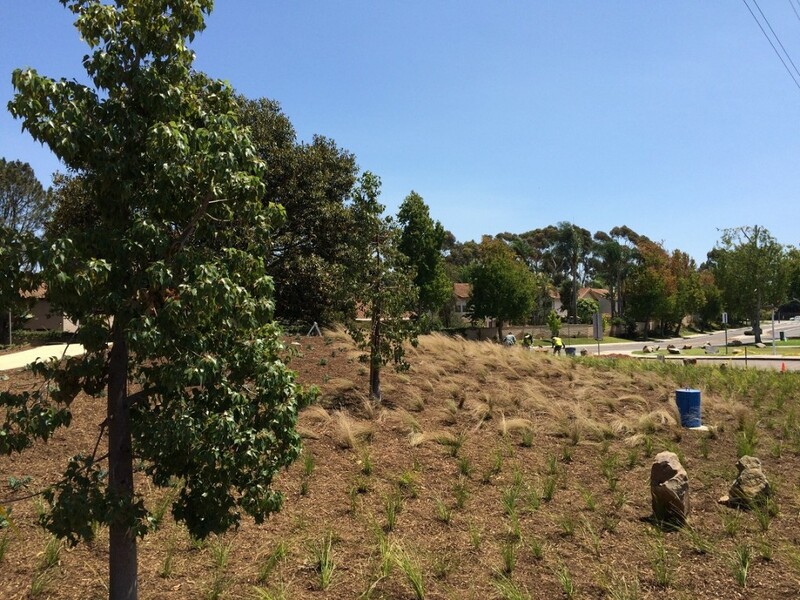 Environmental Considerations: Different tree species require varying levels of sunlight, moisture and soil conditions. Do you need advice and guidance in choosing the right tree to plant? 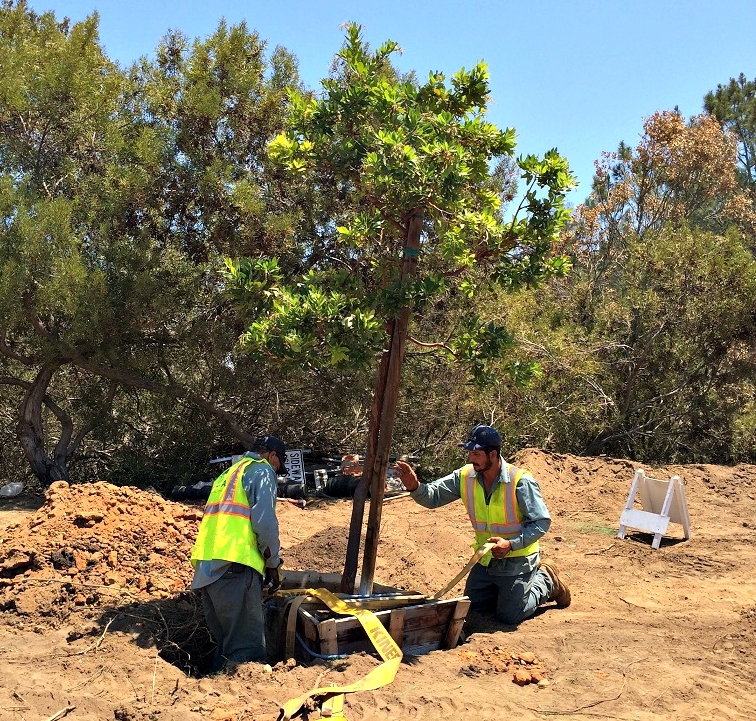 Call us today for a Free Tree Planting Consultation! Unfortunately for those of us running a legitimate and experienced tree service company, our industry is filled with unreliable fly-by-night companies that perform inferior work. Even worse, there are outright con artists who will take your money and never complete the work at all. What can you do to protect yourself and ensure you choose a trustworthy and professional company to perform your tree services? 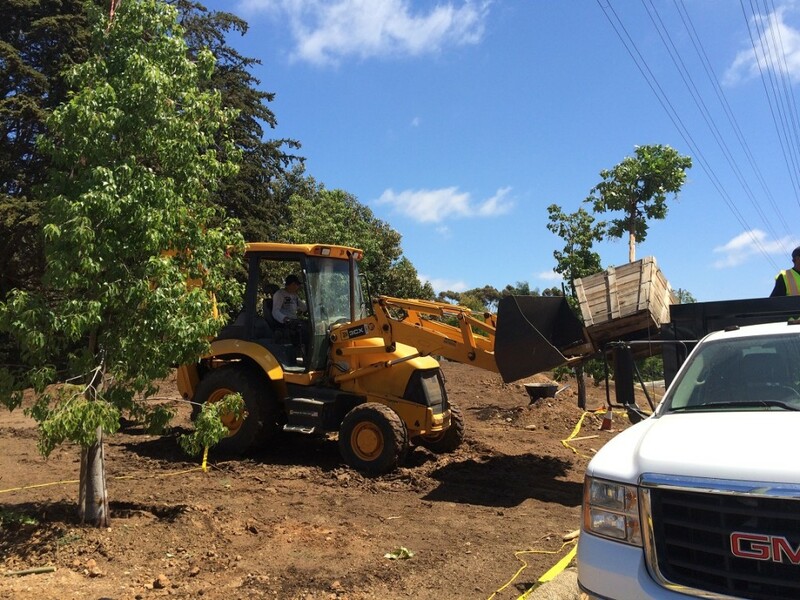 What should you know in order to avoid tree service scams? Based on our years of experience, these 6 tips will help point you in the right direction. Insurance – Make sure that any tree service you consider carries appropriate liability insurance and workers comp insurance. Upon request, certificates of insurance should be obtainable through the tree service company, or directly from the insurance agency. If a company has an accident without being properly insured, you as the homeowner are liable for the damages, including repairs to your property and any injuries that resulted from the accident. 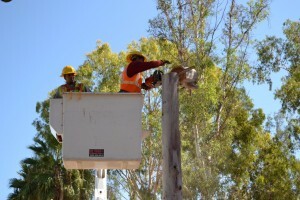 Reputation – The internet makes it quick and easy to research tree service companies and make sure their customers are having positive experiences. Check the company’s Yelp! reviews and their Facebook page for reviews and photos. How long has the company been in business? Are there any complaints outstanding with the BBB? How long has the company been in business? If you need the extra assurance, ask the company for references. Too Cheap? – You know the old adage: If the price seems too good to be true, it probably is. We all hunt for bargains, but red flags should come up if a tree service company is quoting a price that seems too low. This may mean they a) do not have proper insurance, b) they have little to no experience, or c) they intend to perform inferior work or complete only part of the project. Too Pricey? – Tree services can be very expensive, so you might experience sticker-shock if you are unfamiliar with these costs. However, you as a consumer can do a little research on these costs and obtain multiple estimates to ensure you’re getting a fair price for the work to be performed. Apples to Apples – When reviewing multiple estimates, be sure you consider what is actually being offered by each company. One tree service may be offering extra services or some additional benefits you should take into account. If there are large price discrepancies between companies, be sure to ask why. One company may plan to fell the tree while another tree service will remove the tree in small sections. Felling a tree is quicker and easier, but may cause more damage to your property. Removing a tree in small sections using a pulley system is much safer, but it requires more time and effort, thereby increasing the costs. 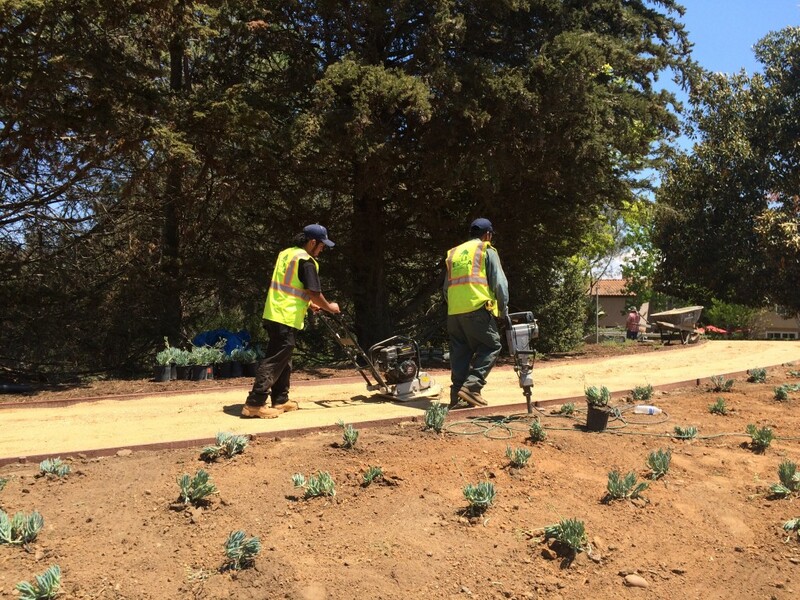 Pay When Satisfied – Even when you’ve selected a tree service company you feel comfortable with, remember that you should not pay for a tree pruning or removal project until you are satisfied with the work performed. It’s unfortunately all too common for homeowners to pay for tree services in advance only to never see the company again. 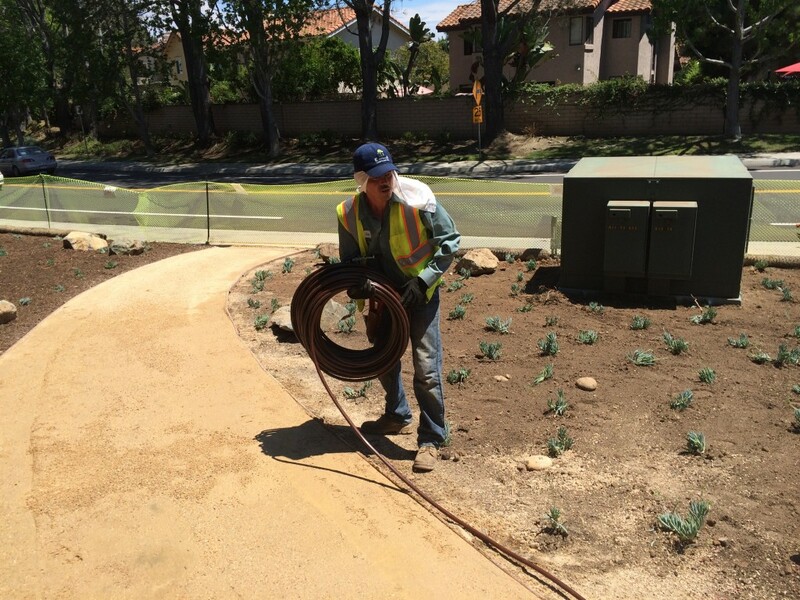 Unlike the construction industry, a tree service company should never need to be paid in advance for work to be completed. One common trick used by dishonest companies is to start a project, collect full or partial payment to “cover the costs of the job,” only never to be seen again. 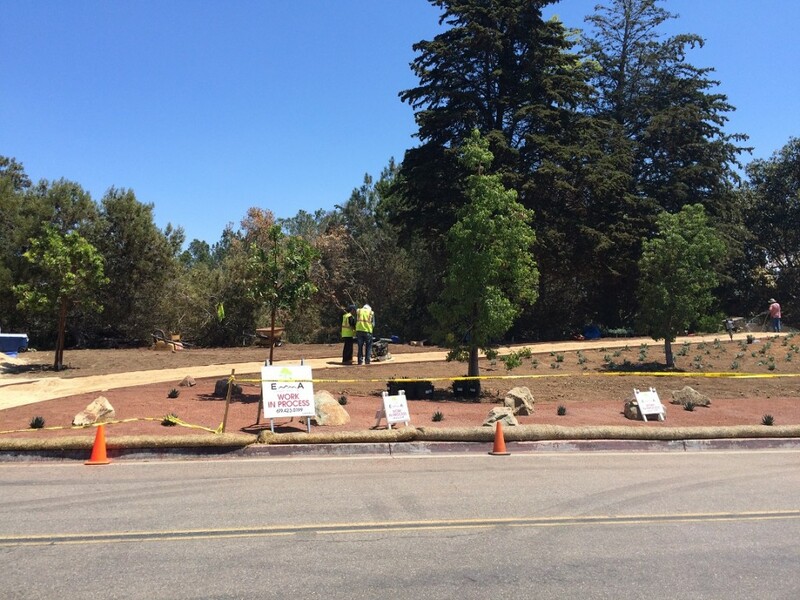 Buyer Beware: Don’t pay a cent until the tree service project is completed and you are satisfied with the service. By asking the right questions, doing a bit of research and using common sense, you’ll be doing your part in choosing the right tree service company. Whether tree trimming, tree removal, tree planting or other tree services, contact us today to receive a free quote for your tree service needs. When is the last time your palm trees were trimmed? Did you know they need to be trimmed? 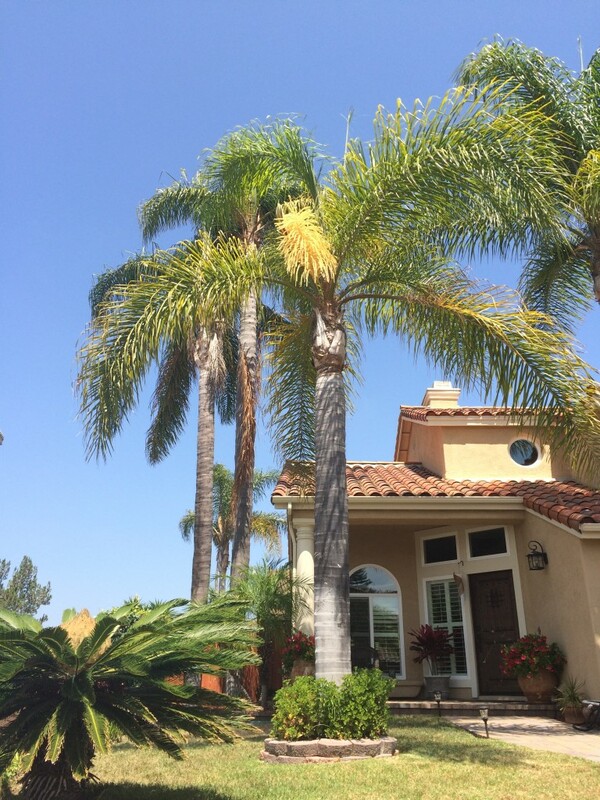 There are several species of Palm Tree commonly used in San Diego landscaping. Most of these will require occasional pruning, while some will need to be trimmed every 12-24 months. 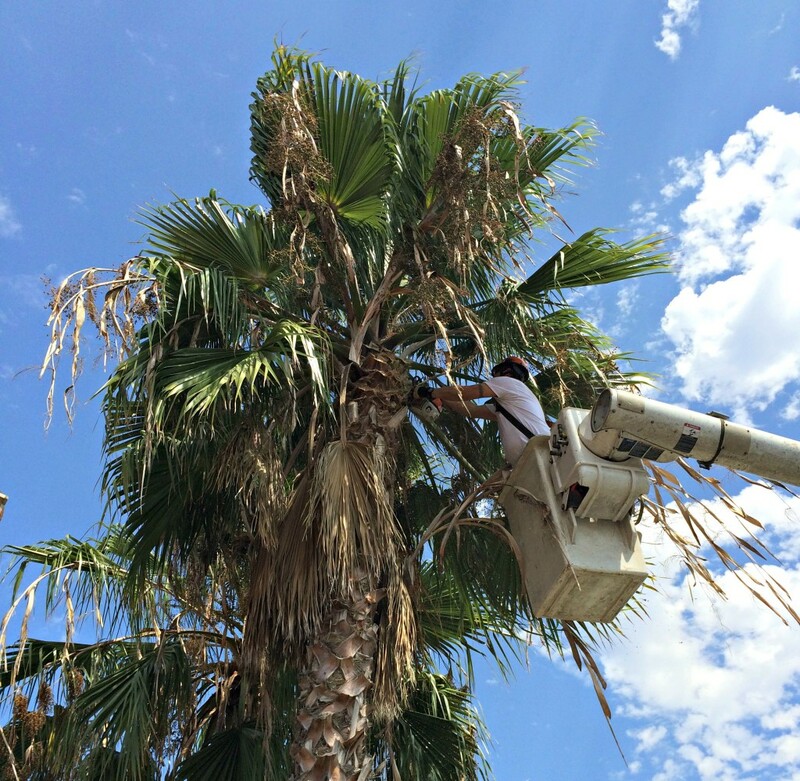 Palm trees are trimmed for many reasons, including safety, aesthetics and the health of the tree. 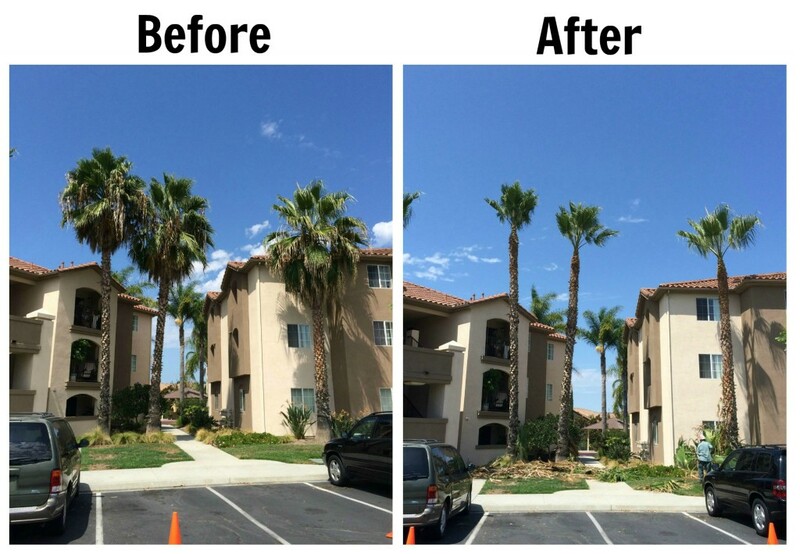 Palm Tree Trimming involves removing palm fronds that are yellow, brown or broken. 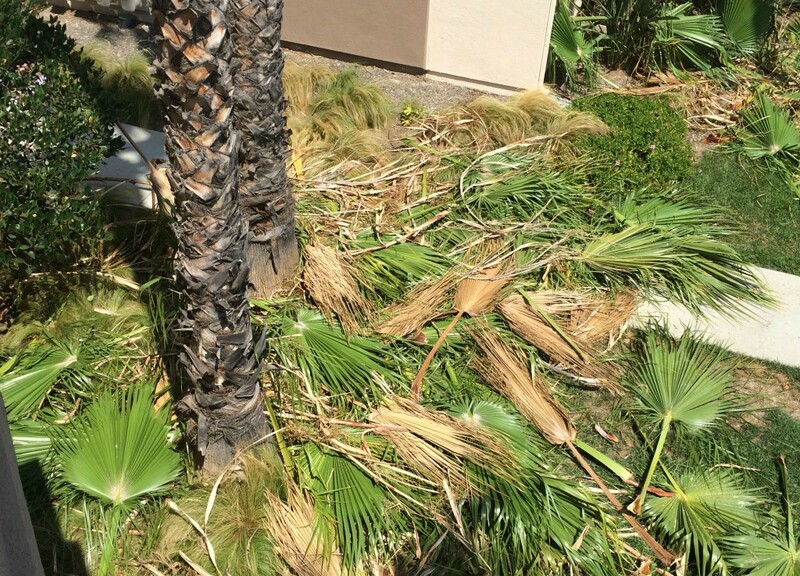 These dead fronds have the potential to fall and cause damage. Many palm fronds are quite large and have sharp spines and edges that could be very dangerous if they were to fall onto a person or animal. Palm Tree Trimming includes removing the palm flower and fruit stalks. Though natural, the formation of fruit and seeds can actually weaken the tree unnecessarily. Removing the flowers and fruit frees up nutrients that will benefit new fronds, roots and storage reserves. The fruit produced by palm trees can serve as food for pests and will later drop, making a mess and possibly staining concrete surfaces. 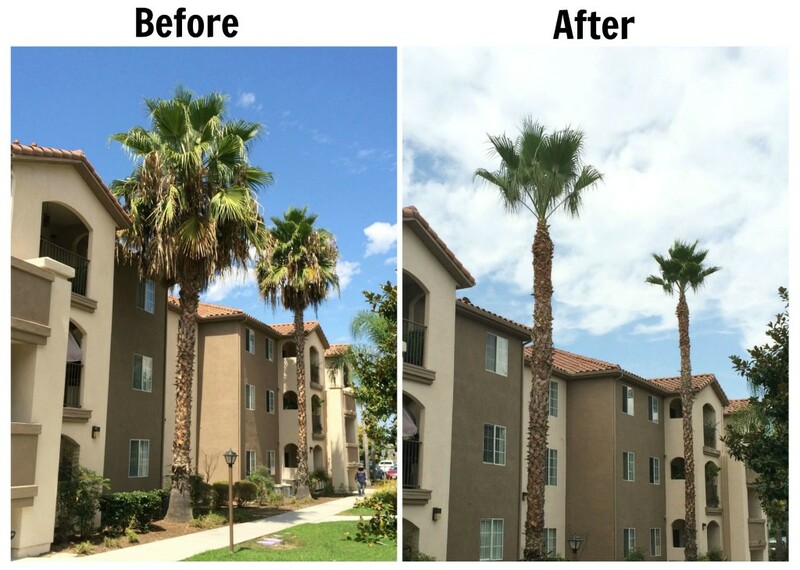 Are your palm trees in need of a trim? Contact Us Today for your Free Tree Trimming Estimate! 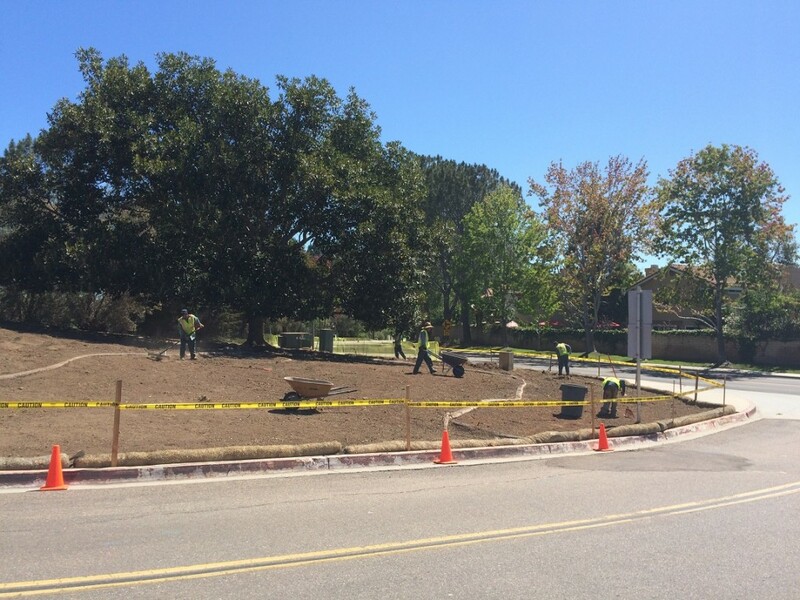 This August, we were contracted to construct a small park in order to beautify a utility substation in a lovely neighborhood in Del Mar, Ca. 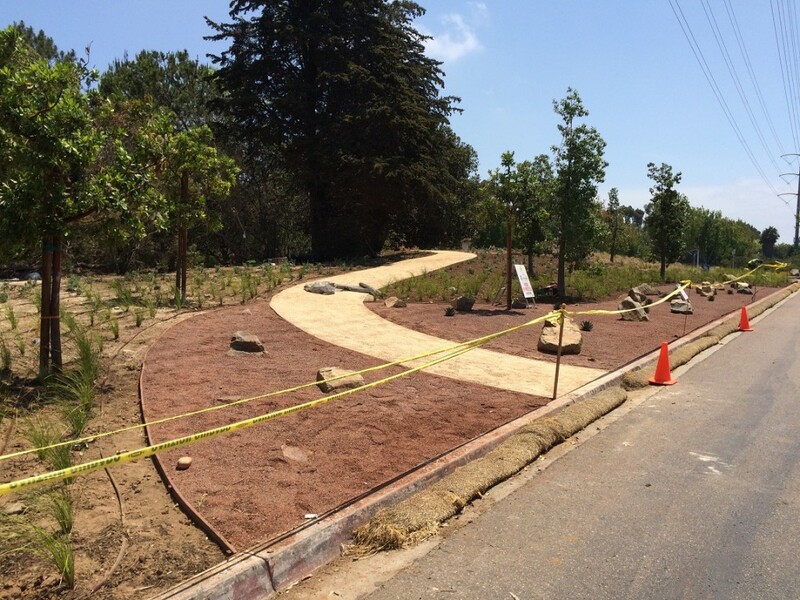 Over 17 days, we transformed a bare lot into a vibrant and beautiful park area. 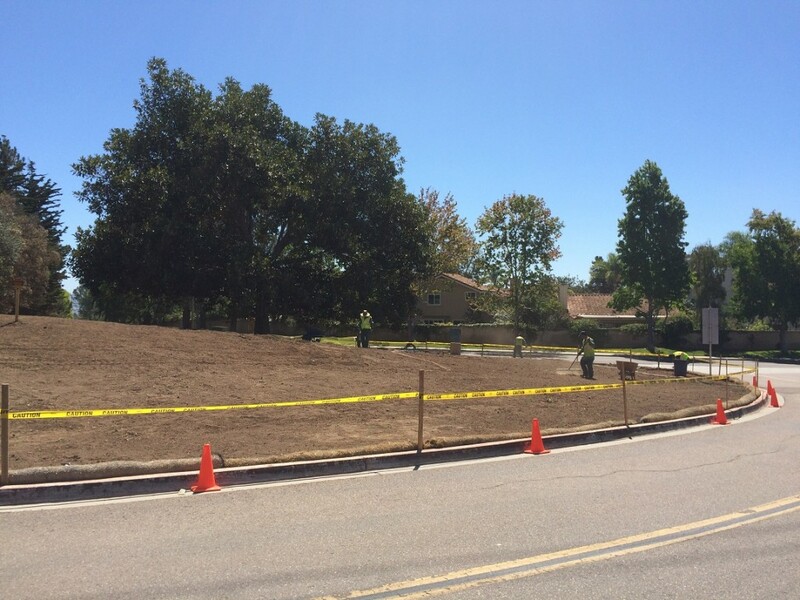 We performed turf removal, one tree removal and cleared the soil of all debris. 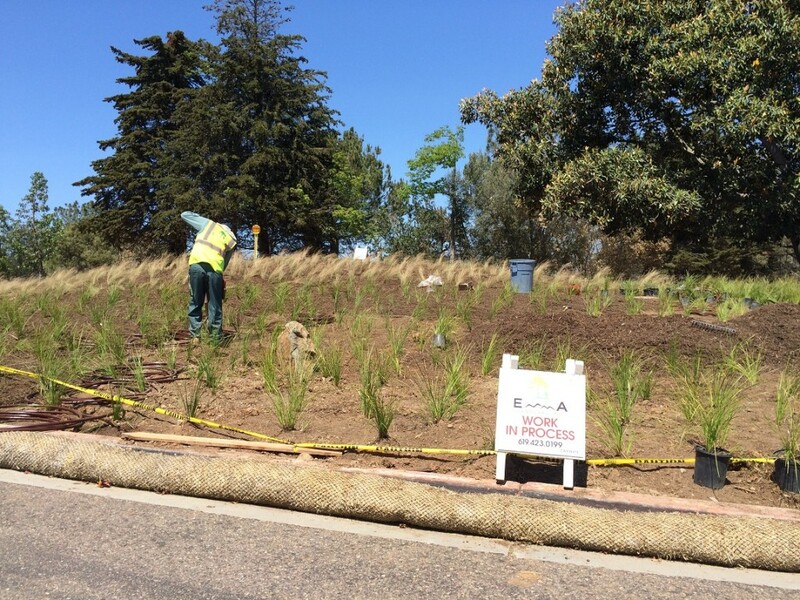 We planted various drought-tolerant grasses and groundcover plants, as well as creating rock garden areas of decomposed granite and boulders. 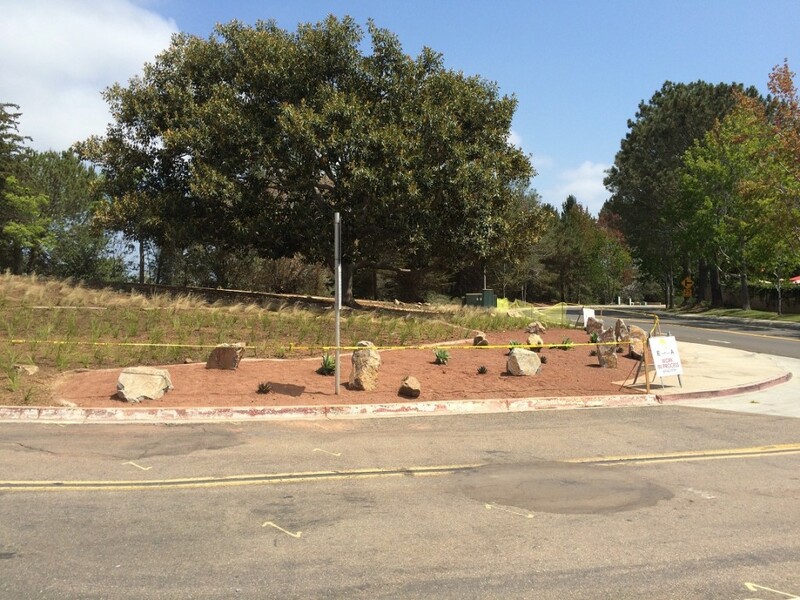 The boulders, besides aesthetics, will help prevent vehicles from accidentally driving into the park. 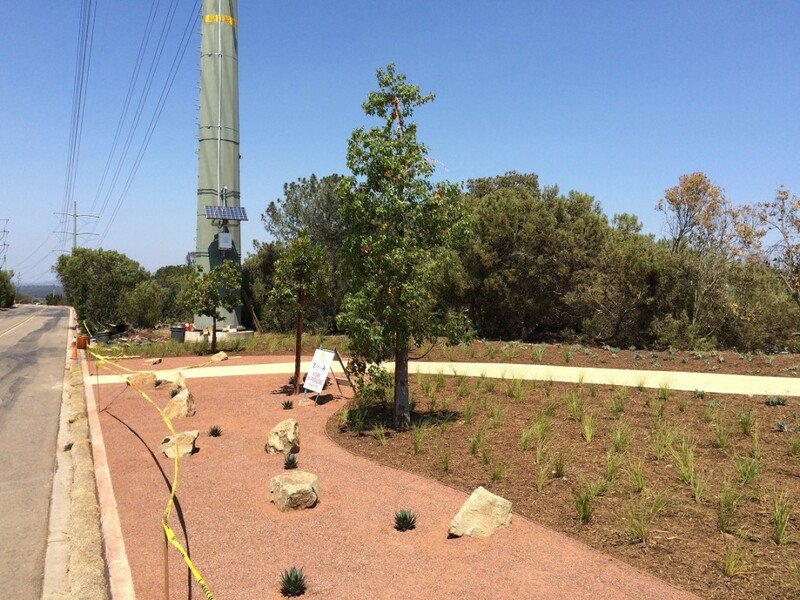 Drip irrigation was installed throughout the park will efficiently water the plants while avoiding water waste. 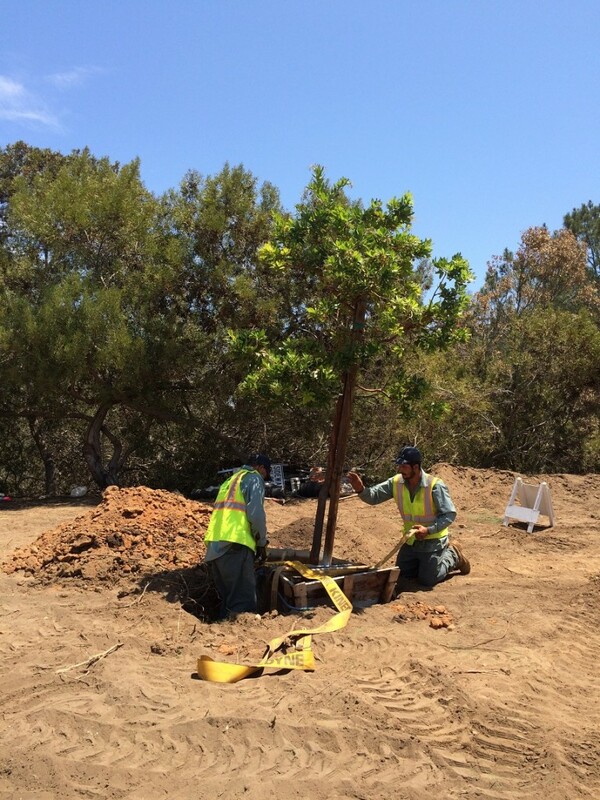 Using all our own equipment, we planted 6 new trees: 3 Arbutus and 3 Brachychiton. 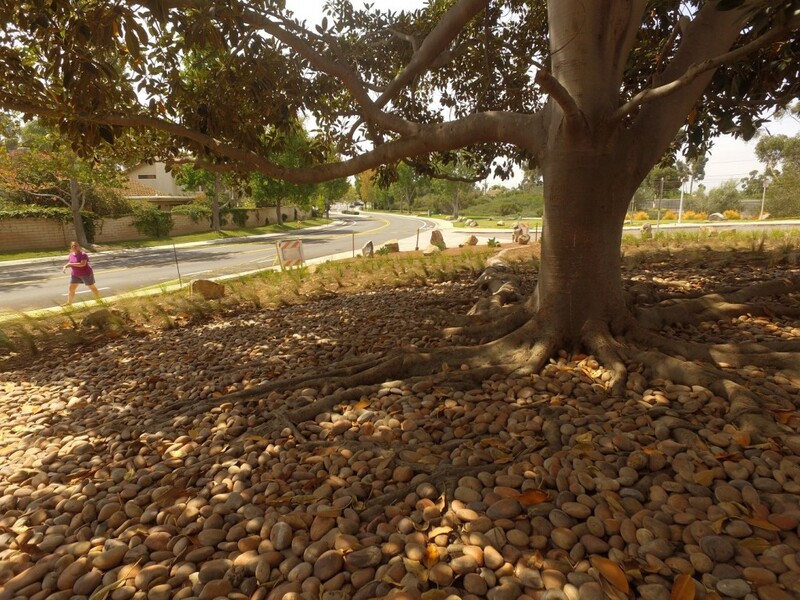 The magnificent Fig Tree and its’ roots are highlighted by sunburst pebble stone. We also used the roots to delineate between the various grasses. 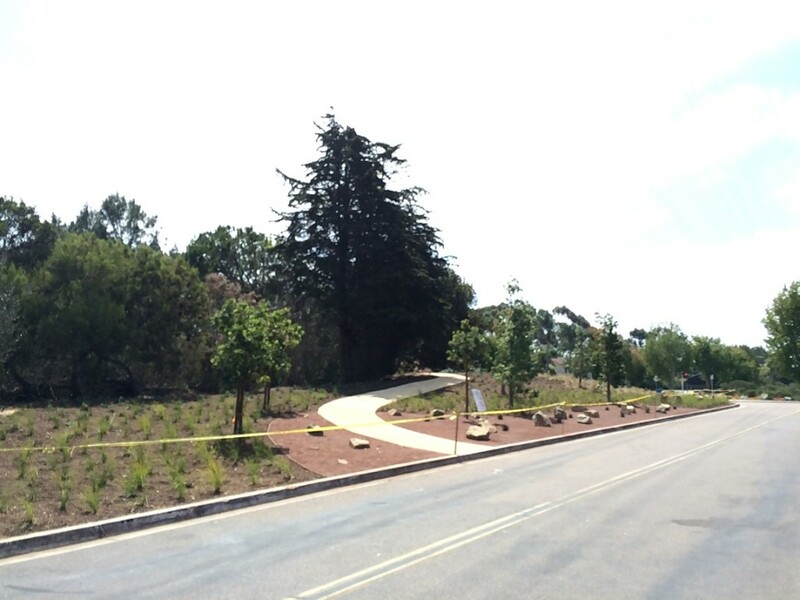 The walking trail made of decomposed granite provides a nice, shaded path through the park. The finished product is a gorgeous park with many layers. 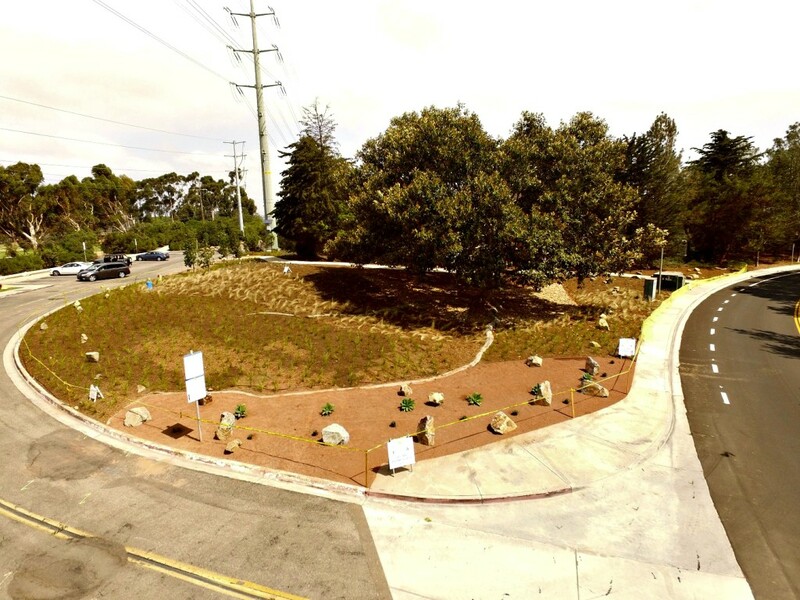 As the grasses and groundcover plants spread and the trees grow, this park will become a shady, functional and beautiful addition to the neighborhood.